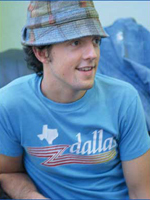 Singer/songwriter Jason Mraz hails from Mechanicsville, VA, where he grew up as a fan of the Dave Matthews Band and local roots musicians the Agents of Good Roots. But it was Mraz’s interest and participation in musical theater that was his first introduction to music. 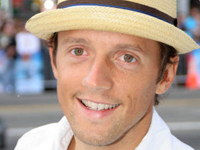 Mraz moved to New York following high school to attend the American Musical and Dramatic Academy but dropped out a year later when he took up the guitar and began to focus on songwriting. Nonetheless, Mraz’s training as a vocalist would show itself on his debut album which is marked by the pure clarity and range of his vocals. After busking around New York, Mraz eventually returned to Virginia; but, in 1999, he ultimately made his way West, settling in San Diego, CA, known for its coffeehouse scene and support of singer/songwriters, most notably Jewel. Mraz began playing local shops and landed a weekly slot at local hot-spot Java Joe’s. At the same time, Mraz met drummer Toca Rivera and the two began performing together — Mraz on acoustic guitar, Rivera on djembe — honing a live show that featured as much comedic banter between the two as music.